Regardless of the state of our gardens, many of us welcome the warmer weather to enjoy the great outdoors and to make the most of the longer days and warmer evenings…whilst it lasts. The climate of the UK can mean we have very wet summers on days when the shining isn’t signing, high humidity, and cold and bitter winters. Of course, this can vary greatly depending on where in the British Isles you live, but one thing is for sure – garden furniture needs to be resilient to last more than a season or two. The greatest need on warmer days is for seating. And the type of seating can again depend on what outdoor space you have. If you only have a small fenced in patio or balcony, you don’t want year round furniture taking up space for the few days of summer sunshine that we have each year. But, in larger gardens, you don’t want to be continually putting away and bringing out furniture according to the weather forecast either. Fold up metal furniture is a pretty good solution for those who don’t have a great deal of space, and if you do have somewhere to store a fold up table and couple of chair, this can also help the mechanisms seizing and the paint from fading in the daylight as well. If you have a large mature tree in your larger garden, a custom made circular bench seat encompassing the tree can have dramatic effects. Plastic tables and chairs are a lot more aesthetically pleasing to the eye than in years gone by. These are also cheap and can be affordably replaced. However, they can also be more prone to blowing away in strong winds if you don’t have the ability to store these from Autumn until Spring. 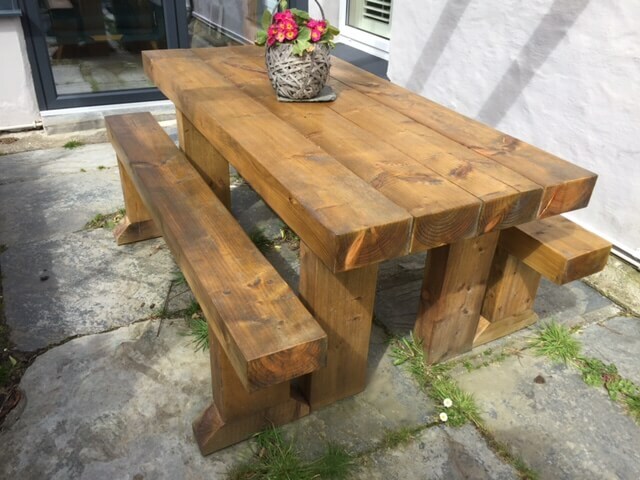 Wooden seating looks highly attractive and is less likely to blow away, but will require regular treatment else the wood will rot. We’d recommend a product like Patina (a sort of wax type varnish) to be applied a couple of times a year. You can even buy tables and chairs made from reclaimed railway sleeps. Natural seating shouldn’t be over looked. If you have a stone wall, or a BBQ area, you can create seating within the actual structure.